The name was derived from Italian merchants who had their stalls both in the open space and in the arcades of the burghers’ houses, particularly in the Rudolfinian time. From the left, Lindsbauer’s gas lamp-post, the newly installed Křižík’s electric illumination post, the entire undulating front of St Nicholas’s Church, and the plague column from 1713-1715. Around the column are guard stones, to which horses were tied. They were moved here subsequently from various places in the Lesser Town. 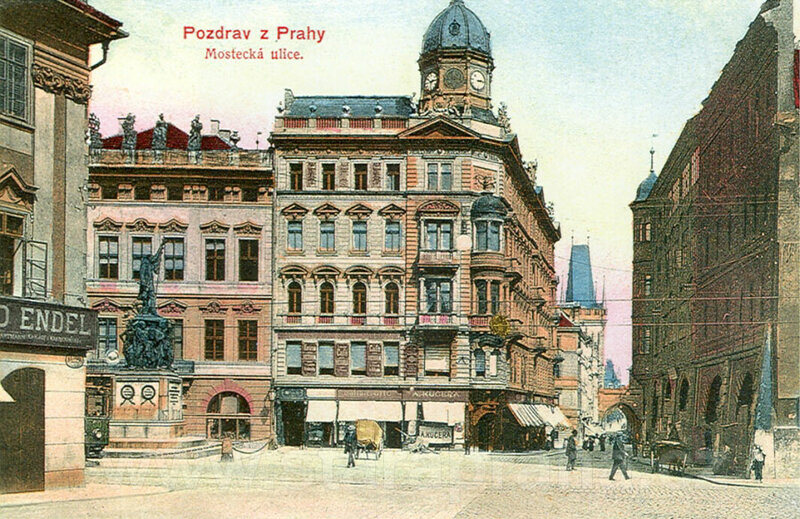 On the southern side of the square can be seen the fronts of two houses U Tří korunek (The Three Little Crowns), No. 260, and the Hartigovský (or Senftenberg) Palace, No. 259, with a passage to Tržiště Street. (Originally, there were two Gothic houses here.) 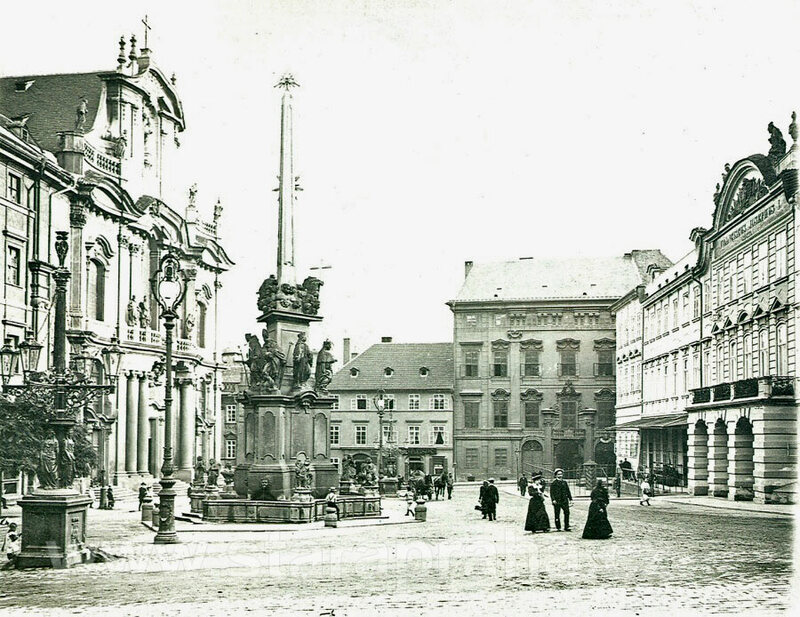 On the right is the Ledeburský or Lichtenštejnský Palace, at that time the Imperial Royal Provincial Military Headquarters. 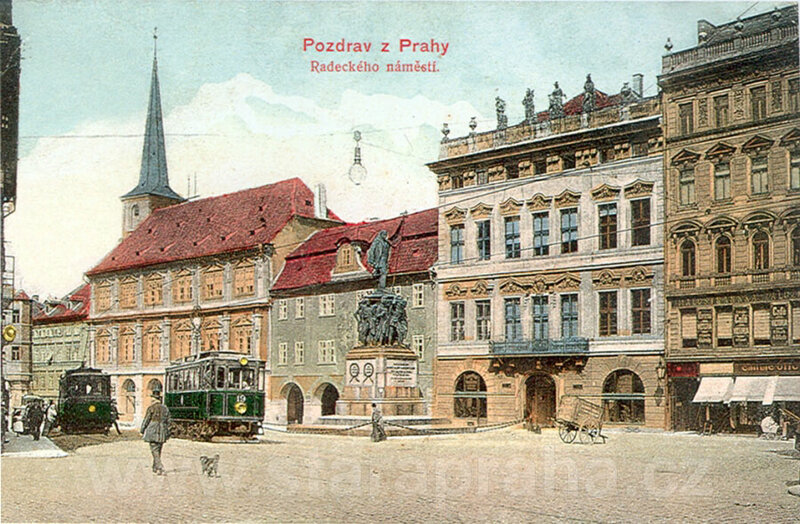 After to which the lower part of Malostranské Square changed its name to Radecký Square. However, the old and established name did not disappear, and so both names were used, even on postcards. Marshal Wenceslas Count Radecký of Radeč (1766-1858), a scion of an old Czech noble house, was one of the most famous and successful Austrian army leaders, the winner of the battle at Custozza in 1848 and bearer of the Golden Fleece Order, the Grand Cross of the Military Order of Maria Theresa, and other high military orders and decorations. The brothers E. and J. Max were designers of the monument (it cost nearly 98,000 guldens), cast in Nuremberg using bronze from captured Sardinian guns. The marshal’s figure stands on a shield carried by eight soldiers from a variety of armies. 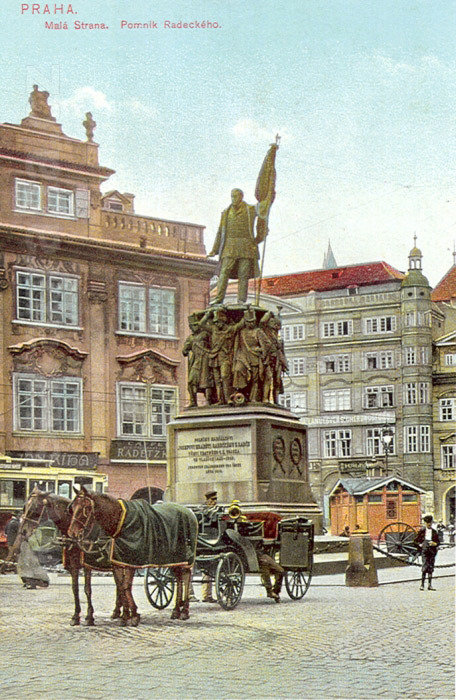 The monument was removed in 1919, after the formation of Czechoslovakia, and it is now to be seen in the lapidarium of the National Museum at Prague exbibition area. On the left, the imposing Grömling Palace, also called U Kamenného stolu (The Stone Table), No. 5, which abuts on the square obliquely. It was formed after 1772 by uniting and rebuilding five houses from the 15th century. 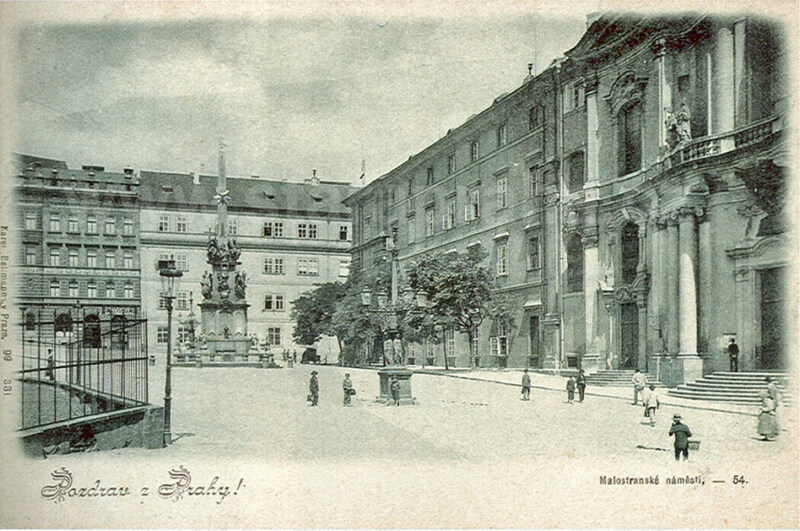 In 1874, the Café Radetzky opened on the ground floor, but was later renamed Malostranská. Behind the monument, on the right, is the Smiřický house with a corner steeple. In the foreground, one can see one of the ranks for hackney carriages. These fiacres, unlike the cabs, were drawn by two horses. On the right, part of the St Nicholas Church front with the abutting former house for professional people or Jesuit College School, at that time the Imperial Royal Chief Provincial Court, No. 2. Behind, the pale front of the Imperial Royal Vice-Governor’s Office, No. 1. On the left, one can see the Svárovský House, No. 204, built on the site of an original mediaeval house in 1888. In the bottom left corner, metal grids, demarcating the guard-room of the Imperial Royal Provincial Headquarters. In the Austro-Hungarian period, all the provincial authorities of the Czech Lands concentrated here. A grouping of three masses of material with differing elevation and ground-plan design. K. I. Dientzenhofer, in cooperation with A. Lurago, proved his architectural mastery when he erected the two towers of the St Nicholas Church over the uninteresting, somewhat higher, Jesuit house and the lower spread-out Grömling Palace. Viewed from this angle, they control the space of the Square and the entire Lesser Town (V. Hlavsa, J. Vančura). The slim belfry of the Church by A. Lurago seems to grow up naturally from the Grömling Palace; without it, the entire complex would be completely different. The picture comes from the time before there were rails for trams in this part of the Square. Rails were laid here in 1900, after the demolition of the first part of the complex U Klíčů (The Keys). 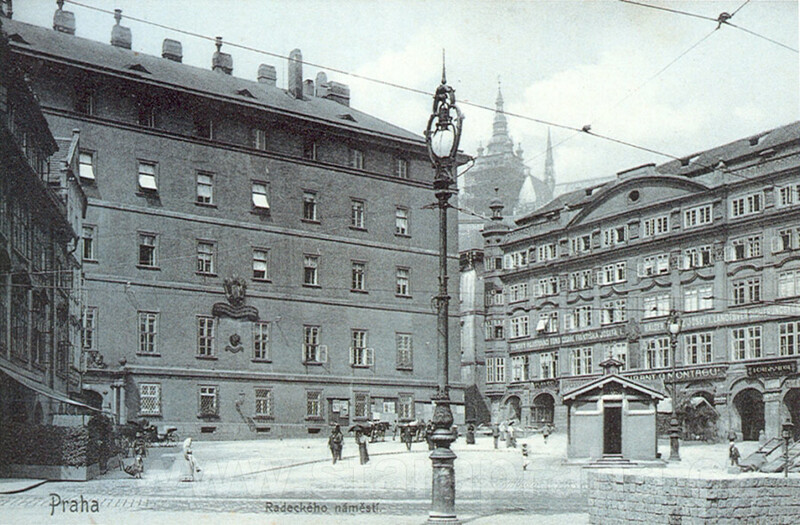 At that time, in the Square, there was only a terminal stop for the horse tram running over the Charles Bridge, the rails of which are outside the picture. 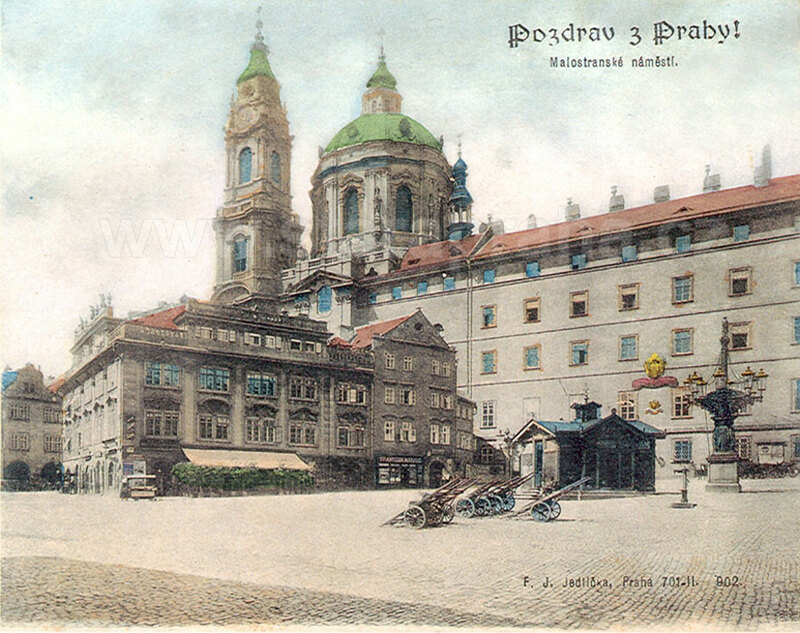 On the right, the Smiřický Palace, No. 6, with a long front containing some Renaissance and Baroque, as well as Neo-Classical, elements, where the Provincial Insurance Fund of Franz Josef I resided at that time. Above the western steeple of the Palace, one can see the main southern tower of St Vitus Cathedral with scaffolding. The entire left half of the picture is occupied by the stern bulk of the former Jesuit College, No. 2, at that time the seat of the Imperial Royal Higher Provincial Court and Higher Provincial Pension Court (for the western part of the building, see picture 68). Farthest on the left, in the shadow, is part of the Grömling Palace with the entrance to the Malostranská Café. The octagonal gas lamp-post disappeared, being replaced by the cast-iron posts of the electric illumination system. On the right stands one of the standardized public lavatories. It should be said, in praise of the designers, that these toilets were never felt to be a disturbing sight, wherever they might be located. On the left, the Baroque Šternberský Palace, No. 7, with an arcade, the pillars of which were reinforced by inclined supporting columns. On the second storey, between the windows, is a Baroque picture of the Madonna. The next house, with the continuing arcade, called Velikovský, No. 518, already stands at the corner of the square and Tomášská Street. The original house from the 14th century has gained its appearance after a few stylised rebuildings; sgraffiti decoration was carried out in 1899. The next, also a corner house, is the well-known Pilsner pub U Schnellů; behind it, St Thomas’s Church (see picture 58). On the right, Malostranská Beseda, No. 35, already a centre of cultural life of the Lesser Town at that time. Until 1784, the town hall was here, followed by a fiscal office after 1793, later an income-tax record office, but also a political prison. 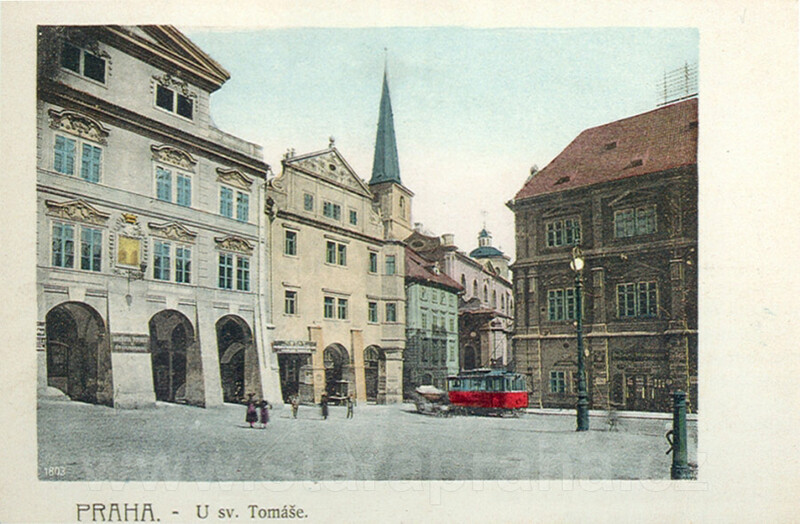 The tram in the picture, making for Tomášská Street, had linked Smíchov with Klárov and the exhibition area no longer than two years before. A view from the opening in the house U Klíčů (The Keys), north-eastwards. The nearer tram goes to Karmelitská Street or to the mentioned opening (see pictures 95, 96, and 98), as the traffic in Prague was conducted on the left-hand side of the road until 1939. Houses from the left: under the top of St Thomas’s Church, the historically valuable building of Malostranská Beseda; behind the Radecký Monument, the house U Splavínů, No. 36, with the Virgin Mary fresco. Next in line is Kaiserštejnský Palace, No. 37, formerly the Petzold house. The Palace is built on the long narrow plots of (originally) two Gothic houses, so that its rear part reaches as far as Josefská Street. Four statues, representing four seasons of the year, stand on the attic gable of the roof cornice. The world-known Czech opera singer E. Destinnová (Ema Destinn) (1930) lived in this palace in 1908-1914. On the right, the house of the Lesser Town Savings Bank. On the left, part of the Grömling Palace where, on the ground floor, E. Endel, the hairdresser of archduke Ferdinand Charles, lived around 1900. A certain K. Hartmann took over the business; he prided himself on the somewhat higher title K. u. K. Hof-u. Kammerfriseur (Imperial Royal Court Chamber Hairdresser); this meant that he was also entitled to cut the monarch’s hair. Behind the monument, one can see the Kaiserštejnský Palace. In the time of Ferdinand I, the seat of the regular mounted postal service was here; it first served only for the authorities but, later on, it delivered private letters, too. Once a week, it made contact with Vienna and other towns abroad. On the right, the Neo-Renaissance corner house of the Lesser Town Savings Bank, No. 38, built by the master builder Skuček in 1895. J. Šula supplemented his project with the front of the building. It is a remarkable fact that the building proper of the extensive complex took no more than one year. Furthest on the right, the eastern side of the opening U Klíčů (The Keys) begins at the corner of the house No. 271.